Clark Transportation Solutions is a professional sales agency committed to providing quality products and superior customer service. We serve the traffic, lighting, intelligent transportation system (ITS), and commercial markets in Arizona and Nevada. We are the company with the industry experience to offer solutions to complex problems. We are the company you call when you need a quick, honest answer about a product. We are the company that prides itself on customer responsiveness. We are your partner on projects with technical complexity, limited budgets and strict construction schedules. We are a company that values strong relationships with customers. Long term relationships with our customers put us in an excellent position to earn their business. We have an established reputation, being known for integrity and responsiveness. Our team has experience in sales, engineering, product marketing and management. Each team member brings a unique set of skills that enable us to effectively communicate and solve customers’ challenges. See our complete line of quality manufacturers, request a product catalog or contact Clark Transportation Solutions today. 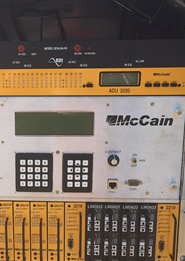 Built with safety in mind, McCain’s revolutionary ATC cabinet series fail-safe design combines the best of existing standards and the latest in advanced technology to provide state-of-the-art intersection control for your most complex intersections. Compact, high-density components offer increased operational efficiencies, reduced liability risk for city management, and safer roads - benefiting all users.